The new addition? . 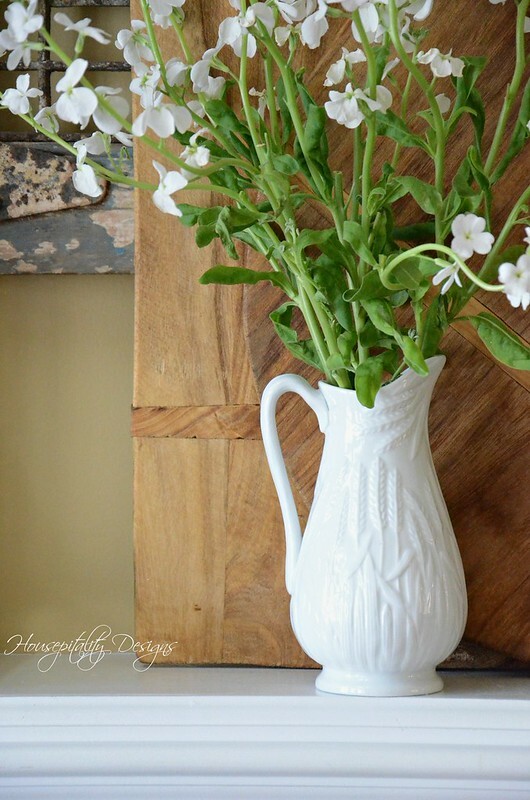 . . A sweet white pitcher that was a birthday gift from a friend. white Stock flowers from . . . you guessed it . . . Trader Joe’s. been a staple/constant on the mantel. in the foyer, to the mantel. this is causing a domino effect thus the need to re-style the French buffet. The game of “domino” is so much fun! Our temperatures here are climbing and the snow is melting. to remove all the “snow dirt” and salt from the roads. I want to thank you all again for all of the well wishes for my mom. the medical personnel who are taking care of her. loved her so much that they put her smiling face on their website! She has that gift of making people smile! 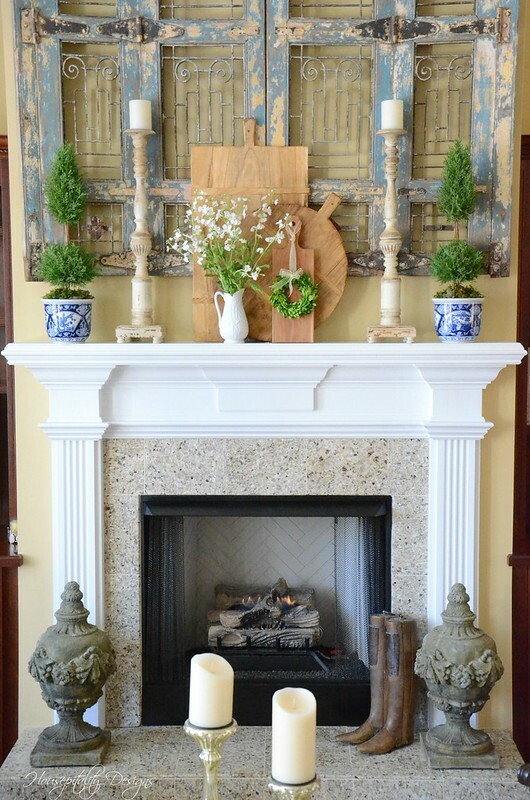 The winter mantel looks great and even makes me think of spring. Yes, your mom does have the ability to make people smile because she is always smiling. She had such a great outlook on life! I like this look. It just looks comfortable and welcoming. 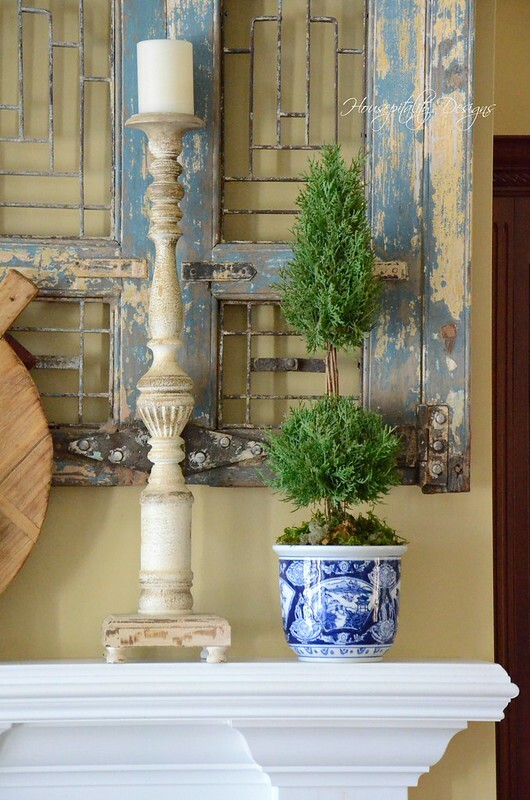 Love the vase and the two topiaries. The blue is a nice addition of color and the vase is beautiful. So glad your mom is doing well. She is obviously a person that is truly happy inside and out! Your mantel is beautiful Shirley! Hope you are thawing out from the recent snow and that your mama is doing alright! Your mantel looks lovely. Can you share where you got those topiaries? They look so real. Glad to hear about your Mom! Your winter mantel is beautiful. 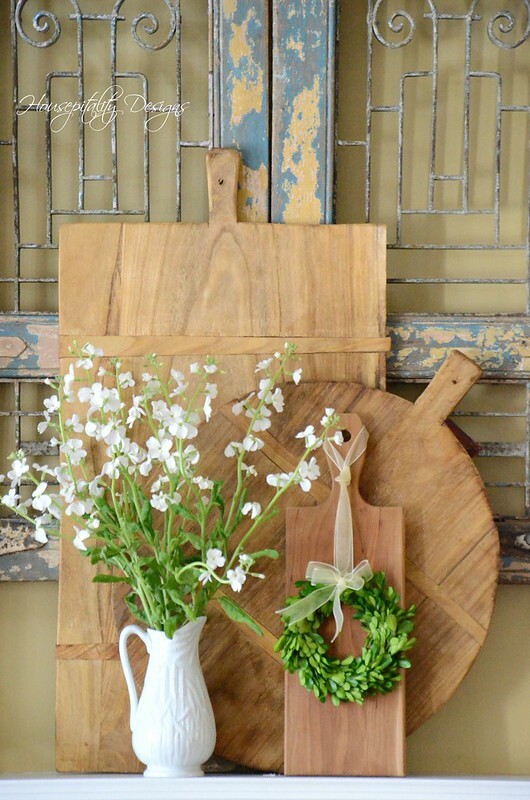 Love all of your bread boards. Glad to hear your mom is doing well. Shirley, your mantel is just beautiful! I want those blue and white topiaries! They look perfect on your mantel. I have the domino effect going on at my house too. I think it is from being stuck inside so much. We purchased a new living room sofa, chair, and artwork which kind of got things going. I hope that you have a Happy Tuesday, sweet friend!!! Your mantle looks lovely! 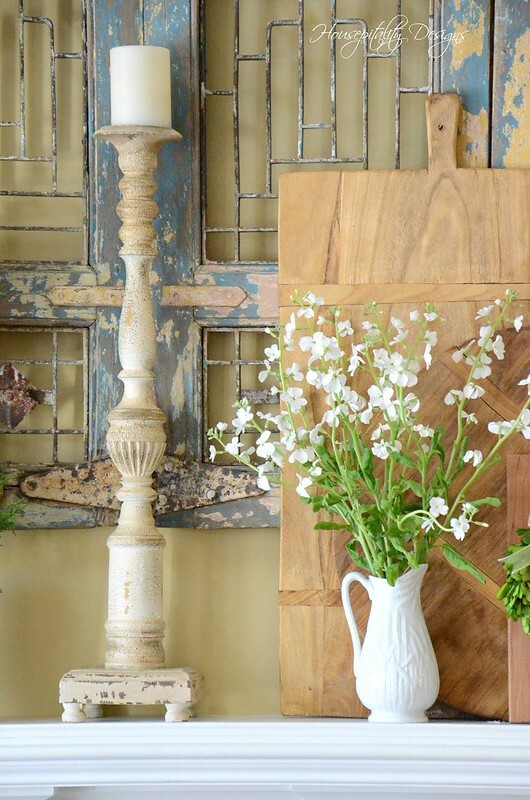 Knowing how to arrange all the elements turns a vignette from simple to simply beautiful–something you do so well. So glad to hear your mom continues to improve and so cute that the eye clinic has her on their website–love it! It’s easy to see from whom you got your sweet personality, Shirley. Hugs! Your mantle is so pretty. Love your white pitcher with the stocks, and the topiaries are perfect and beautiful. So glad to hear your mom is doing well. Happy day to you! Sandra at Maison De Jardin’s recent post…A Stroll With Blue! The school I work at is closed today. Roads are yucky. But it is pretty to look at. Thank you for the day brightener. Your styling is always elegant and warm, and this is no exception! Simple elegance! I love white flowers in the winter. Your blue and white containers look real nice against the gate! So glad your mom is doing well. I don’t think I knew that your Mom was banged up and is now in need of PT! I truly wish her the very best in her healing efforts. My goodness! Give your Mom a hug for me!!! 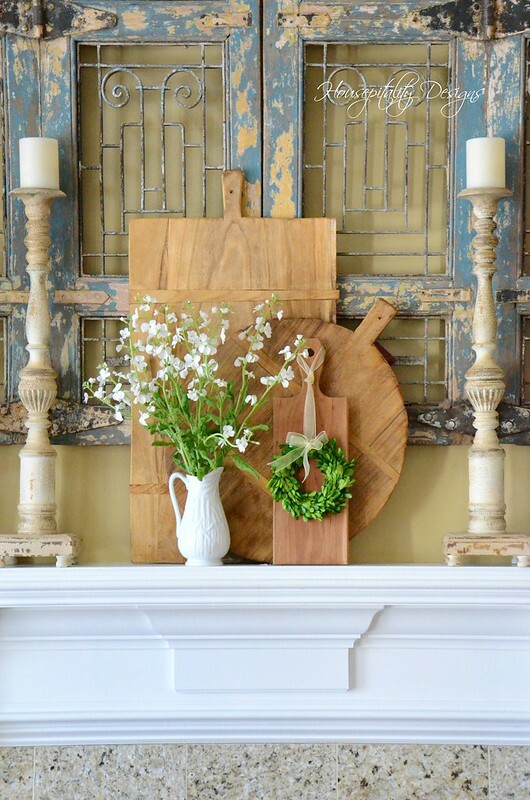 Oh…and please come do something to our mantel! Alycia nichols’s recent post…A New Year and A New Me! So pretty and simple, love all the pieces. 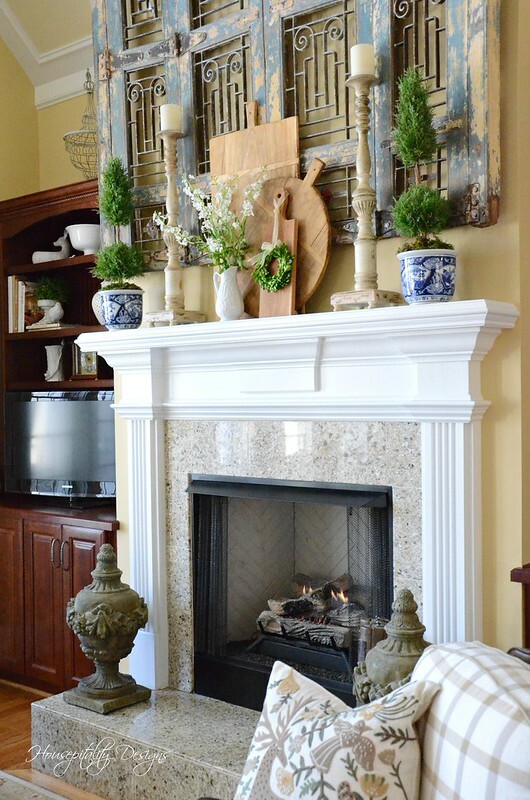 Shirley, the mantel looks so fresh with a hint of spring! I am so glad your mom is recovering so well! Her smile is contagious! Stacey’s recent post…Throwing Kindness Like Confetti! So beautiful! Fills the rooms with such a class without getting all the attention, love it! I just love, love this mantelscape. When I saw the preview on your INSTAGRAM, I had to stop, pause, admire and comment. I hope you never stop blogging. I look forward to each and every one of them. My hopes are that you will publish a decorating book using your home as a guide. Love everything you do! I love your color palette and decor! So warm and inviting, and not grey!